ABSTRACT: Developmental theory helps us gain a concept of what unblocked or free flowing developmental process looks like in terms of the fulfillment of human potential. The integrative developmental framework emphasizes the continuing evolution of the whole person; ultimately it is a spiritual process. The results of the stimulus of forward development and progression that is provided by the normative crisis of midlife, with its adjustments to aging and mortality, is examined in respect to the Consciousness Restructuring Process (CRP), a process-oriented experiential therapy. The goal of treatment is elimination of blocks to the still-evolving personality and to the course of current and future development. The adult experiences a constant process of dynamic change and flux, and is always in a state of “becoming” or “finding the way.” We present seven hypotheses about development in adulthood, and identify phase-specific issues and challenges, including typical adult rites of passage and the developmental phenomena of middle and later life as well. Erickson’s eight stages of life are used to outline the developmental continuum through the illuminative phase of potential transpersonal experience. CRP often leads to spontaneous initiatory spiritual experiences. The evolution of the authentic self in adulthood is a dynamic process which is part of the lifelong shaping of identity and self-image. The attainment of authenticity is a central, dynamic task of adulthood achieved through restructuring of the self. Confronting the quintessential adult-human experience can lead to integration of the highest order and produce profound awareness of what it means to be human. A number of factors, some unique to adult experience, build on the self constructed from earlier phases of life and develop it further. Some of the most important include: (1) the body, (2) object ties, (3) time and death, and (4) work, creativity, and mentorship. Keywords: Adult development, developmental theory, Erickson, Maslow, Piaget, Gowan, Freud, Jung, midlife crisis, adult passage, rites of passage, death and dying, aging, mentoring, maturity, parenting, marriage, pair-bonding, self-actualization, self-realization, self-image, integrative models, character, vision, soul, spirituality, creativity, peak experiences, ego-death, spiritual growth, transpersonal. Developmental processes occur throughout the life span, not only during childhood. Therefore, the adult is understood to be a complex, dynamic, constantly changing organism. Learning in adulthood is a developmental experience; adult experience is a major determinant of further development. Current experience always adds to and interacts with existing mental structure, which is itself the result of all preceding development. Often this occurs in seemingly discontinuous “quantum leaps.” Most spiritual philosophies or religions describe certain growth processes which result in emergent qualities which define the ideals of adult maturity and fulfillment. Whether it is described in terms of processes (becoming) or qualities/characteristics (states-of-being), the integrative process of dynamic change continues past childhood, into the three phases of adulthood, into old age. The ultimate fruit of this process is the spiritual luminary, or enlightened one. Defining characteristics of this experiential process include emergence of the authentic self, self-actualization, or self-realization. 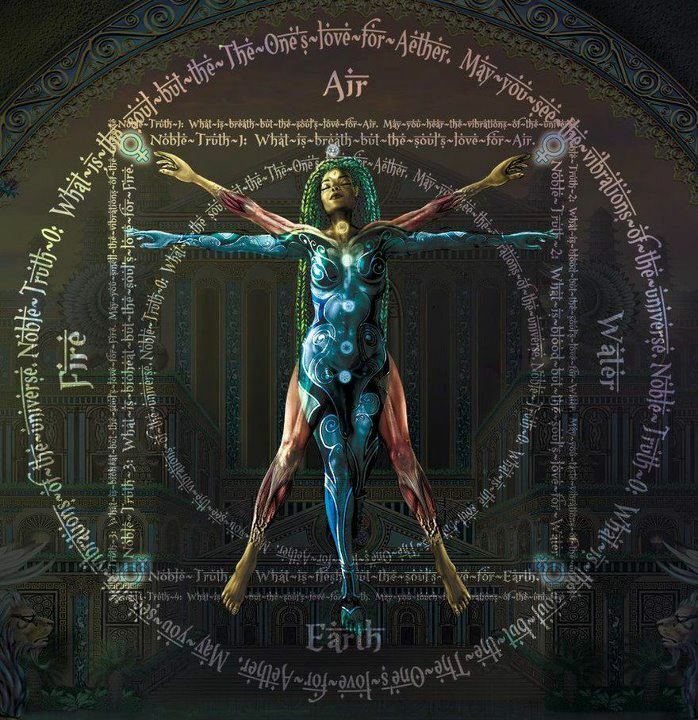 They are expressed in the emergence of spirituality and integrity; wisdom, understanding, and compassion; a realistic self appraisal; and a continued ability for evolutionary change and creativity, with the emergent potential for and possible stabilization of illuminative or unitive experiences. Personal experience and expression of existential, humanistic, and transpersonal goals can lead to fulfillment of human potential. The direct experience is of wholeness, personal connectedness and expansion of consciousness. Our awareness can journey beyond the mere body, emotions, and mind to perceptions and insights which enlarge our sense of self-image in a functional and evolutionary manner, superseding merely personalistic, narcissistic, regressive tendencies in a permanent reorganization. These experiences occur in the context of normal adult passages, the spiritual quest, and in the psychotherapeutic setting. Sometimes expansive experiences are initiated by the awesomeness of nature, alone. Such transformative experiences have been described in religion, in both hierarchical and integrative models, such as the kabbalistic Tree of Life, and in concepts such as the Diamond Body of Sufism and the Superior Person of the I Ching. In Confucianism, the adult is a metaphor of the Way, a term describing the process of maturation involving continuous effort toward self-realization. In the Socratic ideal, the philosopher is the properly educated individual who escapes from the bonds of his deluded senses to the freedom of enlightened reason and clear understanding of the realities of human existence. He is not deterred from the pursuit of truth and justice by illusions of self-importance. Implicit is the ideal of soul seeking “integrity and wholeness in all things human and divine,” with a mind “habituated to thoughts of grandeur and the contemplation of all time and all existence,” and such a person “will not suppose death to be terrible.” (Plato, The Republic, Book VI). Many mystery schools and teachers of meditation describe inner planes of experience which can be accessed by the devoted with spiritual practice. Descriptions of these realms are consciousness maps which describe the typical features of various regions and how to gain access to them. The more highly developed one’s practice, the greater the degree of penetration and mystical union. Several hypotheses have emerged in psychology of the developmental process, including those of Freud, Jung, Piaget, Erickson, Maslow, and more recently Wilber (2000). Jung called the process individuation; Maslow called it self-actualization. Spiritual sources refer to it as self-realization. Ultimately, these processes represent emergent or stabilized spiritual endeavors exemplified by sages, adepts, saints, and spiritual masters. Stated in the broadest possible terms, individuation refers to the innate urge of life to realize itself consciously. 1). Birth-2 yrs. This first phase is the incorporative stage of basic trust and mistrust, conditioning primal hope or a sense of impending doom throughout life. Erikson found that psychotic individuals had easy child-rearing situations that engendered mistrust from unpredictable and chaotic parenting. 2). 2-4 years. The central conflict is autonomy vs. shame and doubt. Shame results when failure is not handled compassionately and sensitively; it leads to defiance or deviousness from fear of discovery. Balance between self-control and self-expression is lost. It relates to the development of self-esteem, love and hate. 3). 4-7 years. Initiative vs. guilt; superego development; parental prohibitions internalized. 4). 7-12 years. The main issue is industry vs. inadequacy; industriousness; social skill development. 5). 12-20 years. Identity vs. role confusion. Emancipation; separation from parents; onset of adolescence; new sense of identity emerges. 6). 20s-30s. Intimacy vs. self-absorption. Sexual relating; pair bonding; parenting. Inability to sustain intimacy leads to isolation and self-absorption, reclusiveness. 7). 40s-50s. Midlife generativity vs. stagnation. Erikson suggested that successful generativity meant the care and facilitation [mentoring] of a younger generation as a key to fulfillment and cohesion in midlife. The alternative is despair, feeling stuck emotionally and intellectually. This loss of forward momentum leads many into therapy. 8). 60s+. This final stage brings either a sense of integrity or a sense of despair. Erikson’s contribution was to make explicit the processes inherent in each stage of human growth which offer the potential for developing personal strength to overcome older weaknesses of the self. Thus, developmental models begin by describing stages of personality stabilization and move even further to describe evolutionary and revolutionary spiritual development beyond the tasks of average adult development, (such as pair-bonding, child rearing, and career building). Normal adult development is not necessarily average adult development. Average adult development tends to plateau at various points of complacent contentment, whereas normal development proactively continues in evolutionary fashion up to and through the moment of death. Just as adult development is a direct extension of childhood development, spiritual development is the logical extension of the adult developmental dynamic. (1) The nature of the developmental process is basically the same in the adult as in the child. (2) Development in adulthood is an ongoing, dynamic process. (3) Whereas child development is focused primarily in the formation of psychic structure, adult development is concerned with the continued evolution of existing structure and with its use. (4) The fundamental developmental issues of childhood continue as central aspects of adult life but in altered form. (5) The developmental processes in adulthood are influenced by the adult past as well as the childhood past. (6) Development in adulthood, as in childhood, is deeply influenced by the body and physical change. (7) A central, phase-specific theme of adult development is the normative crisis precipitated by the recognition and acceptance of the finiteness of time and the inevitability of personal death. John Gowan (1975), (expanding on the work of Piaget, Erickson, Maslow and Rogers), outlined the continuum of the developmental process as the relationship of the individual ego to the collective preconscious which underlies creativity and psychedelic or mind-expanding functions. The preconscious is involved in a developmental process which manifests as anxiety at one end of the scale and ranges to creativity and illumination at the other. Gowan’s use of the term “psychedelic” is not synonymous with “drug induced.” His overview includes the work of Kubie, Sullivan, Tart, Masters and Houston, De Ropp, and Krippner, among others. The developmental continuum includes equally vital dimensions of cognition and affect, rational and emotional development, from childhood through adulthood. Developmental escalation on either of these dimensions can lead to personality change and emergence of new phenomena. Gowan proposed three modes of cognition, (prototaxic, parataxic, and syntaxic), which he amplified as Trance, Art, and Creativity. They indicate the styles and degree of immersion or cooperation between the ego and the preconscious. Gowan’s lifework was to describe developmental stages in different phases (latency, identity, creativity) revolving around issues of trust, autonomy, initiative, industry, identity, intimacy, and generativity, creativity, psychedelia, illumination. Breeches of this order lead to a relative displacement of emotional and mental wellbeing which can inhibit or prevent integration. Gowan used the work of Piaget to define the rational development of the mind, and that of Erikson to chart emotional development. Usually the cognitive level lags a stage or two behind the emotional; but some individuals are emotionally stunted or frozen in their development. He called this dissonance by the term dysplasia, but it is more commonly known as dysfunctionality. Dysplasia is the inability to function in an age-appropriate manner, a dissonance between rational and emotional dynamics resulting in self-defeating and self-destructive tendencies. It is developmental arrest which holds back self-actualizing potential. “Escalation” implies raising the level of action by discrete jumps--quantum leaps in consciousness. Accessing latent energy resources escalates development from one level to the next. Discontinuity is a requisite for change. Gowan defined developmental forcing as trying to escalate from a given stage to more than one stage higher through mechanical or artificially-induced means. He likened this forcing to developmental abuse: trying to use characteristic powers or fruits of a given stage for display purposes when the individual is actually engaged in tasks of an earlier stage. Relative dysplasia results from not keeping up with developmental tasks--failure to escalate. Negatively, the puer personality remains stuck in adolescence. Success at any stage of "development" may promote the desire to continue to play rather than integrating the lessons learned into the task of the next stage. Further development is an evolutionary task/opportunity. This notion fit well in the psychological context of its time--the human potential movement with its accent on growth and upward mobility. It is consistent with classical Jungian psychology and humanistic psychology, the general paradigm of its time. Newer notions in Jungian thought, process work, an even process theology, are less focused on the developmental perspective of the coping heroic ego--becoming--and more focused on the ground state of Being--the dynamic Void or naked Reality. The older views seem to under-emphasize the initiatory capacity of these radically expansive breakthrough experiences, expressed in our cultural history by 50,000 years of shamanic art and accident. A course-correction here in conceptualization could include what we have subsequently learned in 30 more years of study of the unfolding of complex dynamical systems and chaos theory. The difference is one of ego control, compared with “letting go” and trusting the natural process: a paradigm shift from a model of ego strength to one of unhindered flow or fluidity. The new paradigm--which embraces chaos--is expressed in science and psychology in such notions as complex non-linear dynamics, punctuated equilibrium, emergent creativity, and creative self-organization. The notion of development implies hierarchical “operations of increasing order.” This reflects the interplay of the dynamic processes of order and chaos in all forms of change and growth. Increasing order automatically leads to entropy, which facilitates the breakdown of old forms including outworn personality traits and states of consciousness. Experiences of the complex interplay of chaos and order are the instrument of all development as well as that of the “psychedelic individual.” (Miller, 1994). Self-initiation through inner guidance (by happenstance or intent) often leads, in a person with latent shamanic tendencies, to self-induced “shock treatment,” the results of which the person is subsequently forced to confront in daily life. These experiences may or may not be integratable; if not, they lead to breakdown, not breakthrough. Three commonly employed mechanical means are drug use, various forms of ritual or ceremonial magick, and marathon meditation, any of which can force escalation beyond normal social developmental stages. Even in those with a poor social foundation, this “forcing” may crystallize a spirituality or inner-directed behavior which conditions or balances the individual in the short- or long-run. This spirituality may take a conventional, cultish, or idiosyncratic form. Thus, a dynamic if chaotic “path” or direction of development is chosen. The more definitive the commitment, the clearer the emergent non-linear path and creativity. Gowan did allude, but perhaps not fully comprehend in terms of complex dynamics, the dynamic interplay within the transformative process. Within each transition, he identifies certain components of change: succession, discontinuity (discontinuous equilibration), emergence or budding, differentiation or metamorphosis, and integration or creative repatterning. Together they define phases of developmental escalation, or shifting to a higher gear for more efficient use of available energy. 4) that the stabilization and mental health of the preconscious is the key factor in creative output and developmental progress, as well as a factor in psychophysical well-being. Gradually, the traumatic impact of the encounter between the conscious and unconscious diminishes as the individual develops. The person learns how to handle issues of identity, love or intimacy, and finally death. Encounters with the “not-me” symbolize and express death of the ego, and prepare one for physical death by de-emphasizing externally-generated sensory input. Rather than being traumatically overwhelmed, the personal identity is radically deconstructed, creatively re-structured and expands to experience full emotional and cognitive acceptance of both freedom and responsibility. Pushing on our boundaries, we run the risk of rupturing our sense of identity. This is why the concept of a free creativity is always associated with the genuine danger of a “treasure hard to attain,” why madness and genius often appear simultaneously. Peak experiences of creative possibility can lead to self-fulfillment or self-destruction. Mystic at-one-ment crowns the quest after lower developmental needs have been satisfied. Gowan, seemingly a humanist, asserts that the proper use of the awesome power of the psychedelic stage is “to protect and preserve those objects of individual man’s self concept starting with the health and welfare of his body image, and then extending outward to his environmental self and its possessions, his loved ones, his associations and interests, his concerns, and finally his total environment and his creations, thus embracing all of his natural world.” The small ego diffuses through cosmic expansion of the hierarchy of needs toward an enlarged sense of Self. According to Gowan, “man’s highest purpose is not to experience the world of the senses as a reactive being but to design it...to become part of the noumenon of the universe...co-creator...co-designer.” He quotes Troward from 1909 as to how this can be done: 1) There is some emotion, which gives rise to, 2) a desire. 3) Judgement determines if we shall externalize this desire, if approved. 4) The will directs the imagination to form the necessary spiritual prototype; 5) the imagination thus centered creates the spiritual nucleus. 6) This prototype acts as a center around which the forces of attraction begin to work [i.e. a “strange attractor”], and continue until; 7) the concrete result is manifested and becomes perceptible. This creative imagery cycle has practically become the foundation principle of New Age thought. Essentially, this same process is echoed in the transformational realities of experiential psychotherapy and process theology and codified in Transpersonal Psychology. The innate self-image is intimately linked to feelings of destiny, meaningfulness, significance, uniqueness, one’s reason for being. When it is unhealthy to the core, we feel purposeless, pointless, life lacks meaning. Whether one follows a conventional path or an unpredictable offbeat journey, life is dull without connection to exploration, discovery, romance, beauty, myth, mystery, and spirituality. We are cut off from our spiritual Source and existential roots. Fromm spoke of man’s urge for transcendence, our need to rise above our animal nature. While Freud described a dynamic psychology marked by depth, Jung and Maslow also described peak experiences as moments of transcendence which are transformative. We are a complex energy field, not essentially separate from the entire Universe. This healing return to the fundamental condition beyond energy and form can be experienced and identified with. Peak experiences are those moments in life when we feel strong, sure, and expansive. They may initiate a new phase of development or a dramatic change in lifestyle. It may occur as the result of a powerful encounter with internal forces. same time provides the new orientation complete with insight and the energy sufficient to effect a dramatic and positive self-transformation. The nature of any image, including innate self-image, is that it is all there at once--it is a Gestalt. Self-image includes character, vision, and calling (vocation), as well as transcendence, a sense of the timeless. We refer to this source as our motivation, essence, character, fate, genius, calling, soul, spirit or destiny. It defines us; we embody it as a spark of consciousness. It heralds our potential for eminence and the exceptional. It links us with the great Unknown. 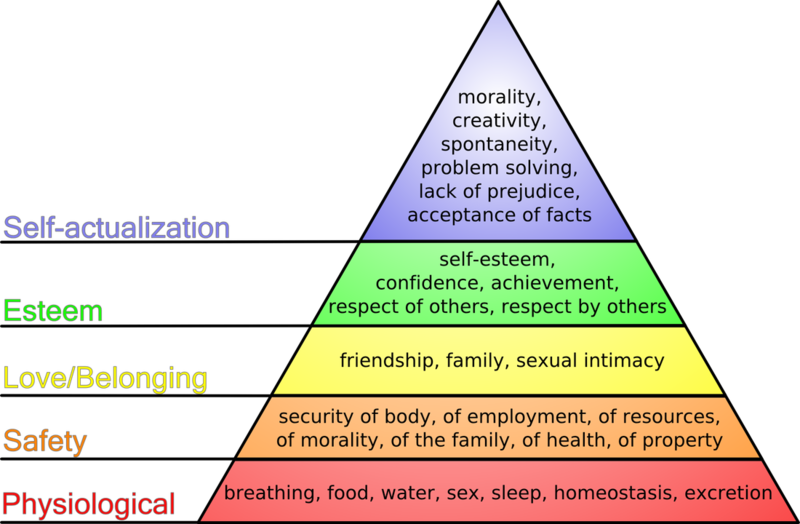 Maslow proposed a hierarchy of needs or drives, in order of increasing priority or potency: (1) physiological needs; (2) safety needs; (3) belongingness and love; (4) esteem needs; (5) self-actualization. He found that growth-oriented self-actualizing people showed superior perception of reality; greater acceptance of self, other, and nature; flexibility, increased spontaneity; stronger focus on problems outside themselves; greater detachment and need for privacy; more autonomy and independence of culture and environment. They also show greater freshness of appreciation and richness of feeling, more frequent mystic or transcendent experience, display brotherly love, compassion or philanthropy, a more democratic character structure, less confusion of means with ends, a philosophical and whimsical rather than a hostile sense of humor, greater creativeness, and resistance to cultural conformity. Not all individuals are “peakers;” some are “non-peakers.” Finding oneself, or one’s center or essential nature, is a self-actualization which requires breakthroughs, but not necessarily “peaking.” When unblocked or distorted, life is a natural process of self-realization. Consciousness is always rising to a new level. Unless blocked, we mature away from rationalization, fear, resistance, escape, commitment-phobia, ego-death paranoia, and profaning the sacred. Movement is toward creativity, joy, commitment, transcendence, insight, harmony, beauty, compassion, bliss, and Higher Power. It comes as a series or stream of refinements. Awareness then transcends the realm of the personal self and enters the realm of the transpersonal, suspending the illusions of time, space, and personal identity. Psychedelic or conscious-expanding experiences are characterized by a sudden, spasmodic, transitory nature, and off-again on-again types of episodes which leave the individual enthralled, but somewhat let down when it is over. Illumination, on the other hand, is a steady state where the art of flowing with the experience has been mastered. But like the display of adventitious psychic powers, “natural” psychedelia is not valuable unless followed up by action and development and integration. It represents potentiality not accomplishment. (Gowan, 1975). For Jung, Maslow, and Grof, neurosis is a failure of personal growth, an interference with the process of individuation or self-actualization. It could be considered a transpersonal crisis or emergency, which interrupts the process of spiritual emergence. In these theories of mental health, extra-psychic success is not enough; we must also include intra-psychic health, coming-to-wholeness. A further outgrowth of humanistic psychology is multidisciplinary Transpersonal Psychology. It is largely concerned with ultimate human capacities and potentialities, such as becoming, meta-needs, ultimate values, peak experiences, ecstasy, mystical experience, awe, bliss, wonder, transcendence of the self, and cosmic awareness or universal consciousness. In this ontological view, the physical or material world is not ultimate. Consciousness, rather than a function of the human brain, is fundamental and undergirds Reality. The self is the core system within which certain basic tendencies are integrated: need-satisfaction, self-limiting adaptation, creative expansion, and upholding the internal order, while striving for fulfillment. We are proactive as well as reactive. The proactive individual strives to attain a freer and more creative state for himself and fellow human beings. Intentionality, purpose and choice are of primary concern. Thus, psychological growth includes self-discovery, self-creation and self-realization. Ken Wilber (2000) argues for a spirituality that transforms, rather than merely helping the self make sense of, and endure the realities of life, since that does nothing to change the level of consciousness in a person. He promotes the shattering liberation from the separate self, rather than consoling, defending, or promoting the self. One function of religion is to fortify the separate self, but shattering or devastating the self (ego-death) is the only way that leads to profound transmutation. The first function of religion or spirituality, creating meaning for the self, is a type of horizontal movement; the second function of transcending self, is a type of vertical movement (higher or deeper, depending on your metaphor). The old self is undermined and eventually dismantled, looked into and through, “grabbed by its throat and literally throttled to death.” Thus, transformation is not a matter of faith or belief, but of the death of the believer and a process of finding and merging with infinity on the other side of death. Hence, the admonition to “die daily” in meditation since a spiritual practice is essential to stabilizing this “always there” atonement. “Those who cannot translate adequately, with a fair amount of integrity and accuracy, fall quickly into severe neurosis or even psychosis; the world ceases to make sense--the boundaries between the self and the world are not transcended but instead begin to crumble. This is not breakthrough but breakdown, not transcendence, but disaster. But at some point in our maturation process, translation itself, no matter how adequate or confident, simply ceases to console. No new beliefs, no new paradigm, no new myths, no new ideas, will staunch the encroaching anguish. Not a new belief for the self, but the transcendence of the self altogether, is the only path that avails.” (Wilber). Thus, the radicaly transformative process offers authenticity, spiritual authenticity, true enlightenment and liberation. Authentic consciousness finds its home in radiant infinity through revolutionary change, rendering the self undone. Since there is only Spirit, seeking Spirit is exactly what prevents its realization; it is an always-already present state. Therefore, the integral approach to overall transformation utterly dismantles the self. We can breathe into infinity. In the material world, we have split the atom, unraveled the genetic code, and probed the birth of the universe. We can do the same psychologically and spiritually; our quantum mind is not essentially separate from Universal Mind; our psychophysical consciousness is Consciousness. Transpersonal disciplines explore realizing these perennial visionary possibilities. CRP, ADULT DEVELOPMENT, AND SPIRITUALITY The Consciousness Restructuring Process (CRP) can be a valuable tool in facilitating adjustments and fundamental self-reorganization at the level of the primal existential self-image. More than fantasy or imagination, this visionary journey fosters insight and radical transformation. The CRP journey is guided by a Mentor who accompanies the Mentee in a co-conscious navigation through the stream of consciousness to the ocean of infinity. The organic restructuring which follows is nourishing and healing; but it leads through dissolution or deconstruction of the ego, passed personal fears and pain. A journey to and immersion in “chaotic consciousness” can be employed whenever adults feel stultified or blocked in their transformative process, or simply for personal enhancement or enrichment of inner or spiritual life. We re-emerge from chaotic consciousness with a holistically repatterned blueprint for Reality which we immediately embody. Though it is healing, there does not need to be any perception that something is wrong to employ the CRP technique with great benefit. It can be used during crises, growth periods, or to stimulate creativity and consciousness expansion. The approach is always to the whole person. Self-actualization, fulfillment of unique potential, is the theme or trend which regulates the interaction between an individual and the environment. Self-actualization is concerned with human capacities and potentialities such as love, creativity, self, growth, basic need-gratification, higher values, being, becoming, spontaneity, play, humor, affection, naturalness, warmth, ego-transcendence, autonomy, responsibility, meaning, fair-play, empathy, openness, transcendental experience, and psychophysical wellbeing. Focus is on the experiencing person, including concepts like the self-image, self-esteem, and the unity or integrity of the personality, the organic emergence of new forms of fundamental reorganization of the whole person. Restructuring occurs at the root level of the Primal Existential Sensory Self-Image (PESSI). CRP is of particular value during the so-called midlife crisis when a multitude of issues, existential realities, and dynamic changes cry for a reorganization or restructuring of the entire life. Reworking and eventual integration of powerful feelings are integral parts of normal development at midlife. Aging and mortality must be confronted and embraced. At any stage, pathology can be seen as a deviation from normal development. The goal of treatment is therefore, not symptom removal, but the elimination of blocks to the still-evolving personality and to the course of current and future development, (which often comes in unpredictable quantum leaps or peak experiences). In the calm that follows this stormy midlife passage, CRP can provide the impetus for the next positive growth stage into such areas as mentoring, or other means of “giving back” to the greater whole the fruits of one’s lifetime of achievements. It is a means of fostering connection with Spirit, contentment, continuous optimal growth, self-actualization (psychological model), and self-realization (spiritual model), an expansive/integrative experience of self and universe. CRP journeys provide a means of consciously connecting with Source and restructuring the psychophysical self image at the most fundamental level. Imagination-REM based, this process is an inner experience which explores the sensory nature and roots of a dream or symptom. REM is attained through breathing techniques, most notably by noticing the stillness and silence at the bottom of each breath. CRP is radically imaginal; imagination is the primary element and mode of experience. “Exploration” is accomplished using imaginal sensory images that arise from the subconscious. Our existential realities and issues can take many fluid forms in this morphological field. Images are followed to their source, to the consciousness structure that shaped and formed them. Dis-eased images dissolve into the unformed matrix, beyond energy and form. Ultimate reality is unknowable directly, and can only be experienced through the images by which it is expressed. When we emerge from that communion, it is with a freshly reborn self-image, created by the freeing of energies formerly locked into the dis-eased pattern. Behavior and physiology are based on perceptions of self and its relationship to the world. Past and present experiences create consciousness structures that are stored as neural patterns and shape these perceptions. This mindbody phenomenon underlies our personal and unique experience of self and reality. Our dream experience is shaped by these inner, conscious patterns (neural firing patterns) that also shape our behavior and physiology. Every dream, among other things, is a self-portrait, but an impressionistic one. Each dream symbol represents different aspects of self, although since dreams are holographic in nature, any part or symbol in a dream also contains the whole. A primary value of consciousness journeys is the recapitulation and symbolic reiteration in an almost fractal-like manner of our entire evolutionary and developmental history. Just as the developmental growth of the embryo and fetus recapitulates the broad strokes of biological evolution, so to the journeys recapitulate our atomic and subatomic origins, our genetic inheritance, our electrochemical essence, our conceptual imprinting, neonatal programming, etc. Thus, any journey can incorporate and modify imagery from all the developmental stages, depending on a wide variety of states of identification and dissociation. Through this means interior processes are deepened, and natural psychedelic consciousness emerges. It is often felt during the resolution or healing phase of the session as profound serenity and a sense of enlargement and communion--an epiphany. This is not the result of a simple translation of the belief system, but a deeper transformation which is associated with the radical deconstruction of ego death. As healing continues (the psychobiological form of creativity), the emergent psychedelia of sessions becomes generalized into daily life. Clarity makes the world looks sharper, more beautiful; love and compassion become easier to embrace. Each developmental advance involves the increased cognitive confluence with an understanding of this deepening interior process. The innate self-image is intimately linked to feelings of destiny, meaningfulness, significance, uniqueness, one’s reason for being. Whether one follows a conventional path or an unpredictable offbeat journey, life is dull without connection to exploration, self-expression, discovery, romance, beauty, myth, mystery, and spirituality. By closing the gap between unconscious emotions and “acting out” with experiential understanding of the sensory roots of attitudinal and behavioral patterns, CRP therapy facilitates healing of developmental dysplasia, promoting existential congruence of mental and emotional faculties. Cognitive dissonance is healed when our self-concept stands up to consensus reality checks and our thinking and feeling harmonize. When we are healthy, our existential reality matches our perception. Head and heart cooperate, rather than tearing us in two. It is self-evident that we usually know what is “right” to do, but we tend to do what we feel like doing, even when it is self-defeating. Consciousness-expanding experiences are the antidote to this malady. They release us from our limitation to the realm of “no boundaries” and infinite potential. When we consciously choose to journey inward, in a safe therapeutic setting, experiences emerge through process work which are virtually identical to naturally-induced psychedelic experiences. This probably has something to do with the serotonin cycle, as most chemical psychedelics exert their influence there. Thus, there are phenomena common to psychedelic experience, mystical states, and process work. They are typically the same images of ego death and emergent reorganization because the process/goal is the same no matter what means we use to facilitate expansion of consciousness. As the ego goes through its symbolic death throes, images of dismemberment and dissolution prevail. The old form dissolves into chaotic consciousness, making way for the rebirth of the newly reborn, expanded consciousness and sense of self. The corresponding physical unstressing manifests as completely involuntary, unintended, spontaneous muscular-skeletal movements and proprioceptive sensations: momentary or repeated twitches, spasms, tingling, tics, jerking, swaying, pains, shaking, aches, internal pressures, headaches, weeping, laughter, etc. Cosmic expansion can bring psychic phenomena in its wake, such as synchronicities and extrasensory perception. Yogis caution that these siddhis are epiphenomena--powers which are actually obstacles to further enlightenment when identified with and employed to aggrandize the ego. Beneficial contact comes through interpenetration of the conscious mind and the universal consciousness field, a return to the primal Source. Mead (1993) reports that meditation can have a definite down-side for some individuals, and these phenomena appear in the Journeys. Rather than promoting relaxation, meditation can lead to stress, anxiety, depression, and even panic attack. The mentor guides the mentee through this portion of the journey, but the “relaxation induced panic” can manifest as muscular tension, racing heart, head pain, and perspiration. The guidance of the mentor prevents the side-effects of self-guided meditation, which in extreme cases can result in breakdown, rather than breakthrough, (schizophrenic episodes, psychogenic illness, and suicidal tendencies). Typical side-effects include sore throats, muscular cramps, tingling or stinging sensations (localized or general), feelings of heaviness or weightlessness, floating sensations, outbursts of laughter or crying, mood swings, involuntary sighing, sweating, trembling, and shivering. All of these manifestations appear in experiential journeys. They come in the initial phases as defenses to moving into pain and fear, and they come during culmination when the mentee releases embedded tissue memories, sensory memories, during the unstressing process. When the sensations are validated and deepened they transform, and the sojourner is transformed with them. Experiential therapy, like meditation, is not a form of relaxation. It is actually a form of effortless attention and concentration, and a simultaneous emptying, which can raise our innate level of available or unblocked spiritual energy (chi, kundalini, Shekinah, “the Force,” etc.) with a profound mindbody altering effect. Once this force is aroused, it is unpredictable just how it will effect the mental, physical, and emotional states. However, when this deep existential imagery transforms, the individual attitudes and fundamental beliefs about self are permanently transformed with it. There is a sense of deep healing of formerly unresolved conflicts, psychophysical restructuring, and rebirth into a renewed life. It changes one’s behavior, one’s lifestyle. Spirituality is not something we possess or attain; it is a Way of life. This is the hero’s journey into consciousness transformation, the age-old quest (see Joseph Campbell work for details). 1. They avoid publicity, fame, glory, honors, popularity, celebrity, or at least they do not seek it for its own sake. It is not terribly important one way or another. 2. They do not need to be loved by everyone. 3. They generally pick out their own causes, which are apt to be few in number, rather than responding to advertising or to campaigns or to other people’s exhortations. 4. Their fighting is not an excuse for hostility, paranoia, grandiosity, authority, rebellion, etc., but is for the sake of getting things right. It is problme-centered. 5. They manage somehow simultaneously to love the world as it is and to try to improve it. 6. They respond to the challenge in a job. A chance to improve the situation or the operation is a big reward. They enjoy improving things. 7. They do not need or seek for or even enjoy very much flattery, applause, popularity, status, prestige, money, honors, etc. 8. Expressions of gratitude, or at least of awareness of their good fortune, are common. 9. They tend to be attracted by mystery, unsolved problems, by the unknown, and the challenging, rather than to be frightened by them. 10. They enjoy bringing about law and order in the chaotic situation, or in the messy or confused situation, or in the dirty and unclean situation. 11. They try to free themselves from illusions, to look at the facts courageously, to take away the blindfold. 12. They feel it is a pity for talent to be wasted. 13. They tend to feel that every person should have an opportunity to develop to his highest potential, to have a fair chance, to have equal opportunity. 14. They like doing things well, doing a good job, to do well what needs doing. Many such phrases add up to bringing about good workmanship. 16. They enjoy taking on responsibilities (that they can handle well) and certainly don’t fear or evade their responsibilities. They respond to responsibility. 17. They uniformly consider their work to be worthwhile, important, even essential. 18. They enjoy greater efficiency, making an operation more neat, compact, simpler, faster, less expensive, turning out a better product, doing with less parts, a smaller number of operations, less clumsiness, less effort, more foolproof, safer, more elegant, less laborious. Caplan, Mariana (1999), HALFWAY UP THE MOUNTAIN: The Error of Premature Claims to Enlightenment, Prescott, Arizona: Hohm Press. Colarusso, Calvin and Nemiroff, Robert (1981), ADULT DEVELOPMENT, New York: Plenum Press. Gowan, John Curtis (1975), TRANCE, ART, AND CREATIVITY, Buffalo: Creative Education Foundation. (197 ), DEVELOPMENT OF THE CREATIVE INDIVIDUAL. (1974 ), DEVELOPMENT OF THE PSYCHEDELIC INDIVIDUAL. (1980), OPERATIONS OF INCREASING ORDER. Hillman, James (1996), THE SOUL’S CODE: In Search of Character and Calling, New York: Random House. Huang, Chungliang Al and Lynch, Jerry (1995), MENTORING: The Tao of Giving and Receiving Wisdom, San Francisco: Harper. Jacoby, Mario (1991), INDIVIDUATION AND NARCISSISM; The Psychology of Self in Jung & Kohut, New York: Routledge. Miller, Iona (1994), “Development of the psychedelic individual: a 20 year retrospective & commentary on the work of John Curtis Gowan,” for Psychedelic Monographs & Essays. Walsh, Roger and Vaughn, Frances (eds.) (1993), PATHS BEYOND THE EGO: THE TRANSPERSONAL VISION, Los Angeles: Tarcher. Wilber, Ken (2000), INTEGRAL PSYCHOLOGY: Consciousness, Spirit, Psychology, Therapy, Boston: Shambala.